Your tour ends at Buckingham Palace. 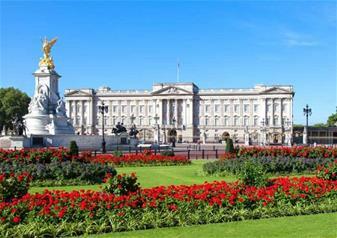 London is well-known around the world for being the main home of England’s fascinating monarchy. If you can’t get enough of the Royals or are fascinated by the history of the monarchy, this tour is for you! You’ll enjoy special timed entry to Buckingham Palace, a visit to St. Paul’s Cathedral and a panoramic tour of the capital during this morning package. Become acquainted with London’s most well-loved landmarks during this exciting panoramic guided tour. You will sweep past a host of top attractions. From inspiring paintings to gloomy crypts, St Paul’s Cathedral and its towering dome is a historical masterpiece. Step inside this three hundred year old church and uncover London’s vast religious history – from the depths of Lord Nelson’s tomb to the towering heights of the Golden Gallery! St. Paul’s Cathedral is a breathtaking church and one of famous architect Sir Christopher Wren’s London masterpieces. After you’ve seen what the rest of London has to offer, the tour arrives at the grand Buckingham Palace for the iconic Changing the Guard ceremony. Watch the Queen’s Foot Guard march to the palace alongside a military band during the traditional performance – they’ll be decked out in their eye-catching red outfits and bearskin hats. The Guards have carried out their duty since 1660 and the ceremony is still a top London experience – nothing beats this utterly British display! Please note: We will visit the Horseguards Parade when the ceremony is not available. Visit the Queen’s official royal residence of Buckingham Palace this summer! Have the special opportunity to venture behind those iconic golden gates and tour one of the most beautiful and extravagant palaces in the world. Explore each room with a multimedia guide revealing fascinating facts on the history of Buckingham Palace and the British monarchy as you go. Walk through the royal State Rooms, regularly used by Her Majesty the Queen and the rest of the royal family and take in the 47 metre-long Picture Gallery featuring the most famous Royal Collection paintings. Be mesmerised by the royal throne room and the lavish royal ballroom before ending your tour in the picturesque palace garden. very easy and convenient. great value for money.